When it won the Best Picture Academy Award, it was regarded as a low-brow lapse, the more culturally correct choice being Watch on the Rhine, which you last watched…when exactly? 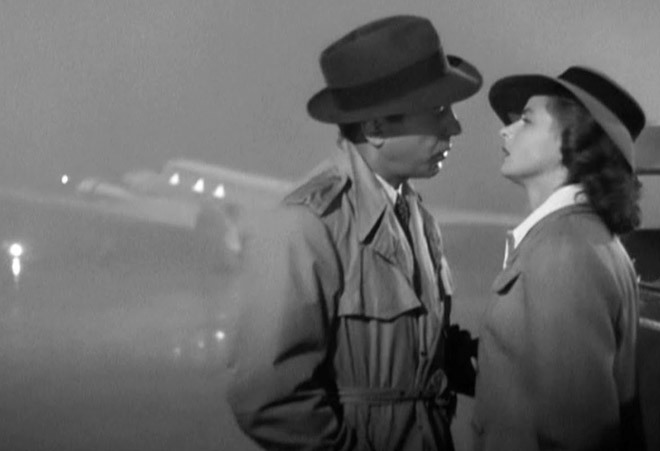 Snobs and Sight & Sound voters protest Casablanca’s popularity to no avail. Originally released 70 years ago this week, it’s the quintessential movie to emerge from the Hollywood studios of the 1940s, made on the fly by pros who wouldn’t be derailed by barely knowing what their picture was about. The now familiar story of exiles, nomads, Nazis, and resistance fighters caught in historic and moral limbo with World War II unfolding around them, Casablanca is an example of the whole being greater than the sum of perfect parts that include Max Steiner’s deathless music, Michael Curtiz’s expert direction, a cast of superb character actors, and luminous co-star Ingrid Bergman. The two indispensable components, however, are the script, considered by consensus the greatest in Hollywood history—witty, idealistic, bracingly cynical in the right measure, with more quotable lines than any film ever—and a romantic lead who had spent his career playing best friends or heavies and didn’t look or talk anything like a romantic lead, thereby changing movie romanticism. To get from Gable to Brando, modern stardom went through Humphrey Bogart. “I kissed him,” Bergman later said, “but I never knew him.” The audience felt the same and liked it that way.